Tyler Olson has been spinning records for the past 15 years, holding residencies here in Austin as well as his home town, Madison, Wisconsin and abroad in London England. 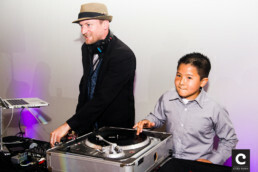 He’s DJed numerous weddings and many individual events including SXSW, ESPN X-Games, The Honda Civic Tour and F1 racing. Tyler prides himself on his wide range of music knowledge and the ability to seamlessly cross-blend through different genres. As seasoned DJ, Tyler excels at sensing the mood of his crowd and playing tracks that keep his audience satisfied.